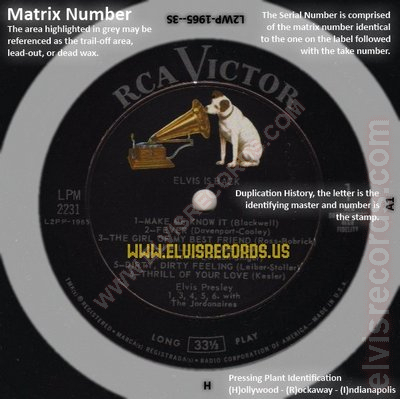 The Matrix Number, a combination of letters and numbers, is a unique identifier for each side of a record. Each variable as part of the number identifies a specific trait about the record, not the recording. Stereo, mono, country, pop, the year, and where recorded are some of these components. This number is printed on the record label. In the example below, the Matrix Number is L2WP-1965. The Matrix Number is also machine stamped or hand etched into the vinyl trail-off area as part of the serial number as identified in this exmaple as L2WP-1965-3S. The image below is intended to assist in the location of the Matrix Number, Pressing Plant, and Duplication History. The purpose of the guide is not to break down the meaning of the matrix number, there are other resources that do that well. The purpose of this guide is to assist in the identification and location of the letters and numbers that are in the trail-off area of the vinyl. The matrix numbers provided on this site are from various collections, these are not the only possibilities. Again, these matrix numbers are provided as a point of reference or even to identify patterns that may be useful in determining the scarcity of a particular release. For example, a practical case is when an album is released in 1962 with the matrix number of XXXX-1234-1S from Hollywood and later found with the orange 1968 label as XXXX-1234-1S from Hollywood, one can conclude that not too many of that album were pressed from that plant.